Do you ever find yourself repeating the same things over and over again in your prayers for your daughters? Ever since we found out we were expecting our daughter, my husband and I began praying with her (almost) every night, even from the womb. It’s become a comforting ritual at the end of the day, a chance to quiet our hearts and turn toward the Lord. Five years later, God has given us two more blessings (another girl and a little boy on the way), and He’s also given me something more: a burden to pray for my children. But honestly, the struggle is real: sometimes it seems like I’m going through a laundry list of requests for God: safety, health, a good night’s sleep (with no midnight wakings, please), and rest for weary mama and daddy. God listens to ALL our prayers, but He wants us to pray BIGGER and BOLDER for our kids. 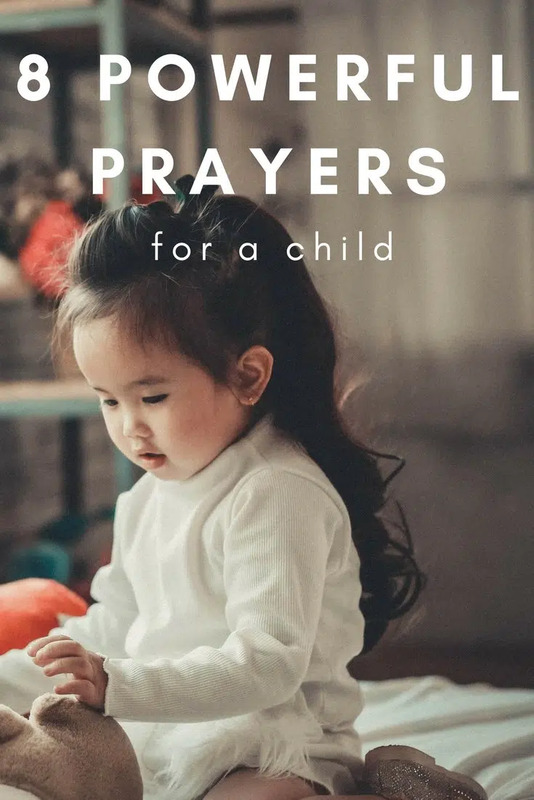 And while God certainly receives and listens to ALL our prayers, I believe He wants us to pray bigger, more powerful prayers for our children and their futures. I believe God wants us to ask boldly for His blessing over our children, and when we ground our prayers in His Word, we can be assured that we’re praying according to His will. I’ve written the following prayers with my daughters in mind, but with a little boy on the way, I’ll definitely be adapting these for him as well! So feel free to do likewise! Here are 8 powerful prayers for our daughters (and sons) based on God’s promises that will help us entrust their little lives to Him! Father, You bless those who hunger and thirst for You and promise to satisfy them with Yourself (Matthew 5:6); pour out Your Spirit on my daughter and your blessing on my girl (Isaiah 44:3). Bring her to a saving knowledge of Jesus Christ (Romans 10:9), and grow her in knowledge and love for You. Guard her from addictions and idols that would draw her heart away from You (Proverbs 4:23), and give her an insatiable desire for You. Quench her thirst with You and cause her to keep seeking You above all else (Matthew 6:33). And when she draws near to You, may she sense You draw near to her as well (James 4:8). Lord, You have promised that Your grace is sufficient and Your power is made perfect in weakness (2 Corinthians 12:9). Help my daughter accept and embrace her desperate need for You, and fill her with Your grace (James 4:6). Make her quick to recognize and turn from sin (1 John 1:9), and place within her heart a longing for righteousness (1 John 3:3). May her words, her actions, and her entire life be an outpouring of Your grace, giving life to those around her (Colossians 4:6). May my daughter’s words, relationships, and life be an outpouring of Your grace, giving life to those around her (Colossians 4:6). Almighty God, Your Word says that those who hope in You renew their strength. They will soar on wings like eagles; they’ll run and not grow weary; and will walk and not be faint (Isaiah 40:31). May my daughter grow in wisdom, in stature, and in favor before You and others (Luke 2:52). Keep my daughter healthy and strong so that she may labor with all Your energy (Colossians 1:29) to do the good works You prepared for her to walk in before the creation of the world (Ephesians 2:10). Just as Jesus came not to be served but to serve, help her to serve others in Your love and to see the broken and needy through Your eyes (Matthew 20:28). I believe Your Word when it says that the fear of the Lord is the beginning of knowledge (Proverbs 1:7). Teach my child to fear you and fill her with wisdom and discernment in her life choices and relationships (1 Kings 3:9-12). Make her mind sharp and give her a discerning spirit, but temper that with innocence (Matthew 10:16) and integrity so that she may walk securely in Your presence (Proverbs 10:9). Precious Father, we fight not against flesh and blood but against spiritual forces of evil (Ephesians 6:12). That’s a scary thought, especially as I send my child out into the world, where I can’t protect her. When I’m tempted to worry about what could happen to her, remind me that Jesus has already won the battle (1 Corinthians 15:57) and You hide Your beloved under the shadow of Your wings (Psalm 90:1-5). Protect my child from evil men who seek to harm her; guard her from the hands of the wicked and from those who plan to ensnare her (Psalm 140:1-5). May You become our refuge and strength, our very present help in time of trouble (Psalm 46:1). Protect my child from evil men who seek to harm her; guard her from the hands of the wicked and from those who plan to ensnare her (Psalm 140:1-5). Lord, You hold her future in Your hands and You know each detail of her life, including who she will marry (Psalm 139:16). Help her trust You with her single years, staying focused on pleasing You in body and spirit and enjoying that season of life (1 Corinthians 7:34). Guard her from men who would use and abuse her, and keep her steadfast in You until she finds a godly man who will love her like You love Your Bride (Ephesians 5:25). May she find joy and satisfaction in loving, honoring, and serving her husband as we are called to serve You (Ephesians 5:24), and may they find great delight in each other (Song of Solomon 5:16). Make their marriage a living metaphor of the beautiful relationship You desire to have with Your Church (Ephesians 5:25), and may all who see them long to have that kind of a relationship with You too. Lord Jesus, You have not given us a spirit of timidity or fear but a spirit of power, of love, and of self-discipline (2 Timothy 1:7). As You mold my child into a beautiful pillar that adorns Your temple (Psalm 144:12), may she stand boldly even in the face of mockery, temptation, and persecution (1 Corinthians 10:13). May she not shrink back and be destroyed by the pleasures this world offers her (Hebrews 10:39) but help her stand firm, letting nothing move her (1 Corinthians 15:58), knowing that You alone are her judge and You will help her stand fast (Romans 14:4). Creator God, You knit my daughter together in my womb; before I even knew she existed, You were fashioning the cells that make her who she is today. Creator God, You knit my daughter together in my womb; before I even knew she existed, You were fashioning the cells that make her who she is today. Help her to praise You when she looks in the mirror, to see the beauty of Your workmanship, and to celebrate Your creativity (Psalm 139:13-16). Clothe her with strength and dignity and keep her free from anxiety and worry; fill her with a joyous anticipation for tomorrow (Proverbs 31:25). May her Christ-centered character be what makes her most beautiful, an inner gentleness and quiet strength that’s rooted in knowing who and whose she is (1 Peter 3:3-4). May her face radiate the beauty of being in the presence of the Most High God (2 Corinthians 3:18), and may she be a fragrance of life and the sweet aroma of Christ among those who are being saved (2 Corinthians 2:15-16). I’ll be honest: just re-reading those prayers again brings tears to my eyes. There is such power in praying God’s Word over our children, and we have plenty of opportunities to do that each and every day. Remember: God listens to our prayers for our daughters and our sons, and He welcomes us to come to Him on behalf of our children. Which of the prayers above will you start praying for your daughter (or son) today?